Are you ever surprised when someone you know to be a good angler turns out to be an artist? How many fishermen have you met that are also painters, writers, builders, etc? After hanging around fish and fishermen for more than fifty years, it has become clear to me that fishing attracts creative thinkers. Fishing, by its very nature requires artistry, innovation, and experimentation. It frequently compels us to turn loose of what we know, and reach out for things we hope for. By now, you’ve probably heard me say that it’s the bad days that make us better fishermen. Catching is easy when fish are biting, and almost any lure you throw in the water will work. Conversely, it’s the tough days that require us to get creative and use the less logical side of our brains. My fishing partner Jamie Clough tells a story about an ancient old fly fisherman who has frequented the meat counter where he works for more than a decade. On each visit, he mentions a spot he used to fish where he caught big speckled trout. His secret fishing hole was right under everyone’s nose and smack in the middle of one of the highest-traffic areas in the Chesapeake Bay. Jamie says he’d smile and nod at the stories, but never gave them a second thought until one day last summer. After an unsuccessful and frustrating morning, he decided to check out the old guy’s unlikely trout spot. Can you guess what happened next? It’s a safe bet that Jamie will never pass by that spot again, and I’m thinking that gentlemen gets an extra-thick ribeye once in a while. The tough days are the ones when we get innovative. When fish aren’t biting we dig around in our tackle boxes to find a different-looking lure or an oddly-colored fly that just maybe, hopefully, will turn our luck around. On bad days, we’re more likely to set off in new directions, explore new waters, or try that unlikely spot we’ve passed over for years. Bad days are when good fishermen get creative. The revolutionary French artist Henri Matisse once said, “Creativity requires the courage to let go of certainties.” While most of us will never paint a stylistic masterpiece like Matisse, good fishermen like to experiment. They aren’t afraid to take risks because they recognize the opportunity for great rewards. Correspondingly, they aren’t afraid to fail. They learn to trust their instincts and go with their gut, even if it sometimes means passing up a sure thing. When it comes to finding trophy fish, a successful gut instinct is something that is developed with time and experience. Since it has to start somewhere, the first step is to get out of your comfort zone and try something new. That’s not always easy, especially if you’re fishing with friends or family or in other situations when you feel pressured for results. That’s why it’s a good idea to fish alone sometimes, or with a trusted buddy who won’t mind if you take some risks and experiment. Simply put, when it comes to fishing, the more you experiment, the better you get. Creative people surround themselves with others who are imaginative and clever. You may not find many fishermen who will outright describe themselves as creative, but you’d be hard pressed to find one who doesn’t constantly refine his or her skills by developing innovative ideas to improve their fishing and the fishing of everyone around them. For example, one of my frequent fishing partners has developed a big-fish-catching technique that is so top secret I can’t even tell you who he is or mention the name he’s given it. It’s a method for fluttering a forward-facing jig barely across the bottom while it moves away from the boat at the same speed as the current. It only works in specific situations and it takes a lot of practice. 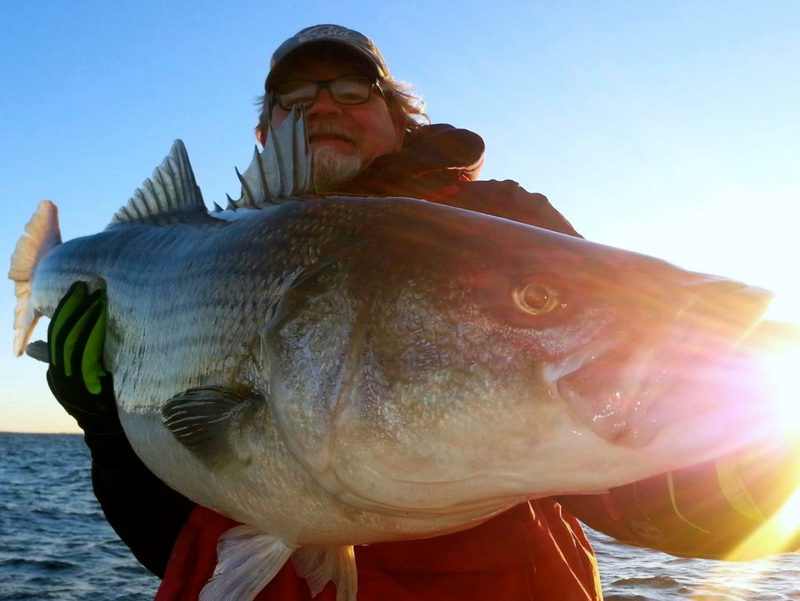 It is incredibly effective for catching trophy stripers. Frankly, I never would’ve thought of it, but after watching him catch one big fish after another, you can bet I learned how to do it quickly. As a result of his creativity, I’ve caught more and bigger fish, including the one you see right here and the one in the picture at the end of this entry. Due to difficult weather conditions, I’ve only fished four or five times over the past couple of weeks. I made it out twice for stripers and another couple of times looking for perch and pickerel. As is usual for this time of year, some days were better than others. The yellow perch run is well under-way in both the eastern and western shore rivers. Numbers seem a little low this year, but some fish are being caught. 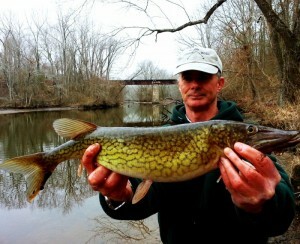 Pickerel fishing has been good on both sides of the Bay. To the left is a picture of Mark Nichols with a nice pickerel he caught while I checked out the yellow perch bite on an Eastern Shore creek last Sunday. He caught three more nice fish like that before I had time to change lures! 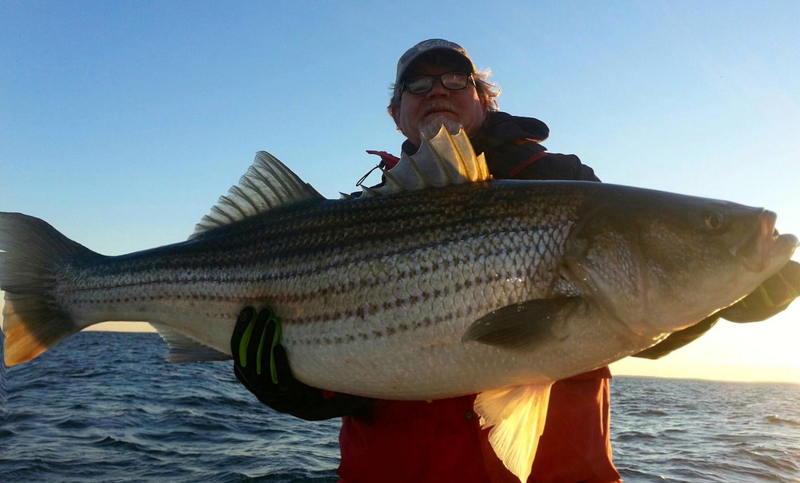 Water temperatures have dropped again so catch-and-release striper fishing is hit-and-miss right now. Most of the fish being caught are near warm-water discharges. All the fish pictured in this report were photographed and released within the past couple of weeks. Another outlet for fishing creativity comes in making lures. Since we usually can’t fish as much this time of year, it’s a good opportunity to spend time gearing up for warmer days. On most winter evenings you can find me in my shop pouring and painting lead jigs or tying flies. Fly tying is a skill I’ve recently become more interested in because I plan to do more fly casting for species such as hickory shad and trout this year. I certainly wouldn’t call what I’m tying an art though. Hopefully, I can refine my techniques this weekend by hanging out with the fly-tying artists at Lefty Kreh’s Tie Fest at Prospect Bay. Hosted by CCA Maryland, this is one of the premier fly-fishing shows on the East Coast. We’re fortunate to have an event like this so close to home. 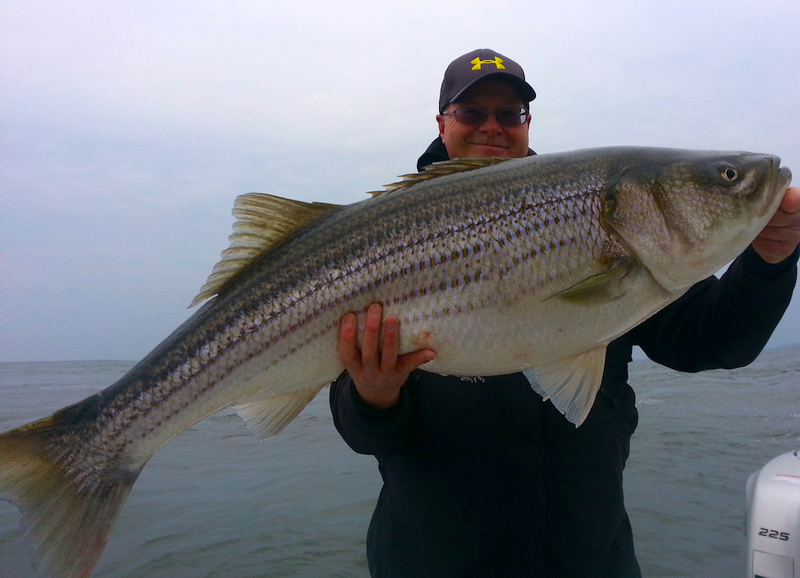 Mastering the fundamentals of light tackle fishing is important and can lead to many fun fishing days, but it takes more than basic knowledge to achieve real success in Chesapeake Bay angling. We have to put those primary skills to use in creative and innovative ways in order to stay on top of the light-tackle game. That’s even more imperative now, since stocks are down and striper fishing is becoming more and more challenging. Mid-Atlantic fishermen are finding that many of the techniques we used a decade ago just don’t work well anymore. This is a good time to think out of the box and refine your own techniques. You don’t have to be a painter, writer, builder, or musician to catch fish, but the best anglers think unconventionally and take the extra creative steps necessary to be consistently successful when the going gets tough. Good stuff Shawn..and yes that guy gets a really nice steak when I see him..haven’t seen him in a while..time to pick his brain again. .love talking to old fisherman.. Thanks for another good article. I’ve been with fishing charters all over the country and in other countries and there are quite a few that have standard ‘go to’ techniques or lures that catch them fish regularly. Even some ‘meat-fleet’ type trolling charters in the bay work like this and it does seem to produce for them. Creativity does seem to work for LTJ for some. I would say I do a lot of experimentation and it usually ends up with the same approaches, lures or colors. It’s true that usually much experimentation is involved to develop these methods. Glad you are making it out to catch more big fish. Thanks Shawn, I needed some good reading today and got it right here…As a lure builder/tinkerer there is a great satisfaction is catching fish on a lure that you have made yourself… even if it something as simple as switching to a single hook streamer on a spinner, hotrodding a jig or tying a fly. I’m interesting in hearing more about this secrete technique …..fluttering jig across the bottom. Great fish as always Mr Kimbro! Lots of fishermen use similar rods, reels, lures, and colors. Lots of bass players/guitarists use similar strings, amps, pedals, and pickups. Lots of fishermen use similar techniques when casting/jigging/retrieving. Lots of musicians use and study similar techniques to learn their respective instruments. We tweak our amps, change our strings, try different pickups and preamps. We change our settings and gear choices depending on the style of music or venue. We listen to the room, we listen to the crowd. We listen to the monitors. We adjust accordingly…well, the better ones do. We sometimes make adjustments that at first seem to make the individual instrument sound worse by itself or on stage, but the overall sound of the band improves. We leave the little fish to catch the bigger fish. Good observations, Daniel. Thinking of putting a chapter in the next book about comparisons between music and fishing. Deleted a bunch of negative comments in this thread because we are all at our best when we promote the best traits of others. Music and fishing…..
Good stuff, just found your site. As a retired fishing guide and middling musician, I took heart from your connections. I have always considered myself more of a shameless imitator than an innovator, and believe me, I have fished with some of the best of both over the years. That said, I have also spent a lot of time over the years personalizing jigs and tying flies for everything from walleye and smallmouth, to red drum and stripers, and feel much more comfortable with my creations than the unadorned jigs or sto’ bought flies available to the masses. While I am still kid enough to delight in murdering the dinks in certain situations, I usually get my share of the big fish by tweaking the usual approaches. I am also unashamed by my preferences, I play a bad fiddle, but I play blues licks on it instead of bluegrass, and switch to harp when the going gets tough. I do, however, bring a wealth of music with me and usually add to the music in my own unique way. The same goes for my fishing. I have also found that I learn much more about fishing when I’m getting bit than when I’m not, so I don’t hustle off for glory when the bite is on. 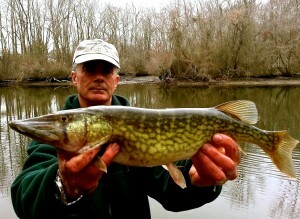 I have no problem staying and learning what the fish are trying to teach me, size of lure, colors preferred, etc. Sometimes I have also found that perseverance can be the ticket to the bigger fish. 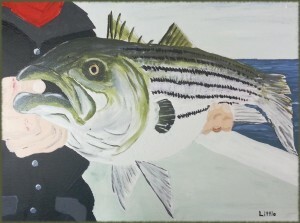 If twelve-fifteen pound stripers on ten lb test and freshwater tackle aren’t good enough for me, I’ll probably give it up anyway, so y’all go on and get those 30 lbers, I’ve been there and done that and will take a dozen nice fish over one hog anyday. I’m like most serious anglers, I don’t target dinks, but I won’t disparage them either.